Black Lawrence Press, 9781625579386, 148pp. Poetry. Translated from the German by Okla Elliott. 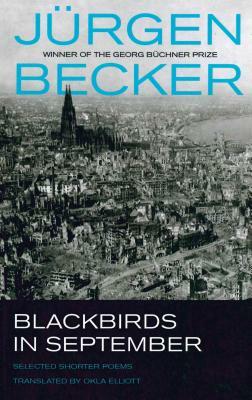 "Jurgen Becker was born in 1932. His childhood, therefore, was the Second World War a disease from which he has been recovering ever since the fighting stopped. His poems do not presume to address the horrors directly, but with great courage he casts sidelong glances at things he remembers or the things that prompt such memories. These are important poems, not just about the war but about any unbearable catastrophe the scars of which last forever. Okla Elliott's scrupulous translations are faithful to the poems' nervous hurt: their appearance in English is a major event." David R. Slavitt.